Who doesn’t want a website with muscle? Magento cloud hosting will beef up your e-commerce store with faster page load times, heavy-duty security and backups, 24/7 tech support and more. As you know, a better-performing site leads to more traffic and ultimately, more sales. So why wouldn’t you want to take your online storefront to the next level? E-commerce is the future of shopping, and Magento is the future of e-commerce. (Check out our article here for the details.) eMarketer estimates that worldwide B2C e-commerce sales have increased 20.1% since 2013, reaching the $1.5 trillion mark this year. Online payment systems, shopping via mobile devices, and new, expanding consumer bases are expected to drive even more growth in the future. The consumer landscape is changing – and Magento stores are spearheading that change. After all, why not? Magento looks great – it’s one of the most aesthetically-pleasing platforms around – and in addition, it’s incredibly feature-rich and powerful. That said, a powerful platform needs equally powerful hosting in order to deliver a dynamic customer experience. (For some tips on speeding up a lagging Magento site, read our article here.) Without the right type of hosting, it’s easy for an e-commerce site to slow down or succumb to security breaches. 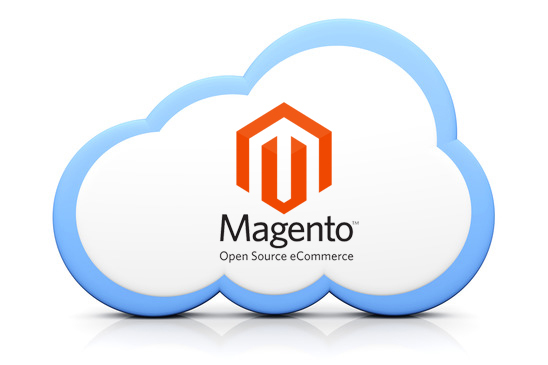 Cloud hosting brings extreme flexibility, scalability and adaptability to the Magento platform. As the global customer base for e-commerce sites expands, cloud hosting maintains consistent, secure access for users in any environment. When a company uses a scalable, cloud-based e-commerce platform, they can move quickly into new markets without hiring extra IT staff. Cloud technology helps cut back on equipment costs, too: instead of paying for on-site hardware and software systems, companies can simply upgrade and upsize in the cloud. But flexibility isn’t the whole story: fully-managed cloud hosting for Magento should also include 24/7 monitoring and tech support, extensive security features, and multiple daily data backups. A high-end Magento cloud hosting solution should focus on cyber safety as much as on scalability. Security concerns can keep an e-commerce store from expanding, so a hosting company worth its salt will take data security seriously. Security in a Magento cloud environment should be able to flex with the cloud, and should include fully-managed firewalls, powerful encryption and an IT staff that’s always on call. In the end, world-class cloud hosting, constant management, and a powerful Magento platform should work together to create an e-commerce experience that’s as rewarding for site owners as it is for end-users. Stay strong. And stay in the cloud. For more information on Magento e-commerce hosting, read our article here.